Podcasts are all about talking and if you can’t clearly hear what is been said, then it totally beats the purpose. The secret to a great podcast is not just great content but an equally good microphone that will make your content sound professional. With so many different microphone models on the market, all claiming to give you the best podcast experience, finding the right one for your podcast recordings can be quite frustrating. This is why we have done the research for you and hand-picked three of the best microphone for podcasting. We are sure there is one that fits your bill. How to choose the best microphone for podcasting? You can simplify the process of selecting the right microphone for your podcasts by looking for these features. Microphones with a cardioid pick up pattern is best suited for capturing speech as they pick-up sound in a heart-shape focusing on the front and a bit of the sides, rejecting the sounds at the back. If you need to have a guest as part of your podcast, an omnidirectional pickup feature can come in handy to capture background sounds. A USB microphone is a much better option for your podcasts as it can be directly connected to your computer. An analog microphone on the other hand will require a pre-amp to convert the sound from analog to digital format. Speaking can produce a lot of popping sounds and hence your podcast microphone should either have an internal pop filter or come with an external one. Cut out unwanted sounds arising due to vibrations from your computer and accidental bumps. Look for a microphone with a shock mount to avoid external noise in your podcast. In addition to the pop filter and shock mount, you will also need a microphone stand for placing it on your desktop while you record your podcast. A side-by-side comparison of specs will let you decide which one of the best 3 microphones will suit your podcasting requirement as individual preference can differ.We go into the features, pros and cons of each of these three microphones to give you an in-depth idea about each of their capabilities. The Blue Yeti USB Microphone – Blackout Edition comes in a unique tri-capsule design and gives you maximum flexibility for a variety of recording requirements as it lets you select between different pick-up patterns. Though cardioid is best suited for podcasting, you will find the other modes such as stereo, omnidirectional or bidirectional useful when you have guests. Simple user controls for headphone volume, gain, pattern selection , mute etc. The Audio-Technica AT2020USB comes from Audio Technica, a company who are leading innovators in the transducer technology. It has both USB and XLR out put options so that you can also connect your microphone to a mixer if required. The USB feature allows you to easily work with your recording software. This one is for the budget-friendly podcaster who does not want to compromise on quality. The ATR2100 is a great microphone that is budget-friendly and great value for money costing you under $100. If you want extremely professional sounding podcasts then the high performance dynamic Heil PR-40 Dynamic Studio Recording Microphone is something that will be worth your investment. 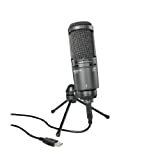 Despite its price, it is a top favourite among many podcasters. The large dynamic element has a smooth frequency response that perfectly captures the voice in the talking range. For this reason, the PR40 is the most preferred for voice-over applications and speech applications in general. A good quality microphone can make all the difference to your podcast recordings and that does not mean you burn a hole in your pocket or compromise on quality. If you want a microphone with flexibility for recording in a variety of situations, then the Blue Yeti will work for you. 2 How to choose the best microphone for podcasting?